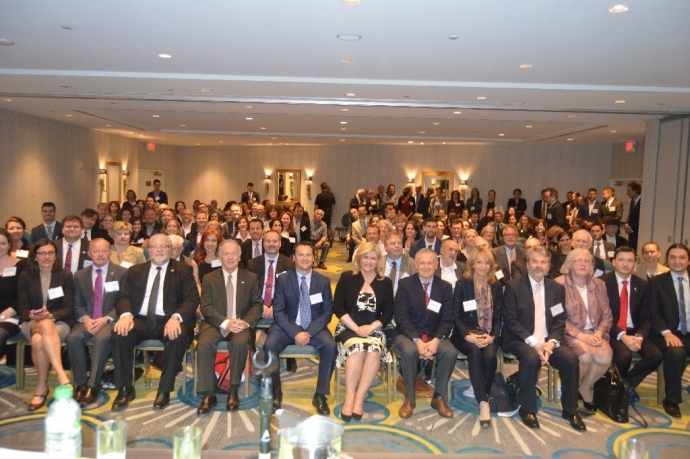 An important conference of Croatian American Professionals in Washington, D.C.
An important gathering of the Croatian diaspora and Croatian interests in Washington last week, which was attended by President Kolinda Grabar Kitarovic. TCN's Steve Rukavina was also there and sent this report on April 26, 2016. 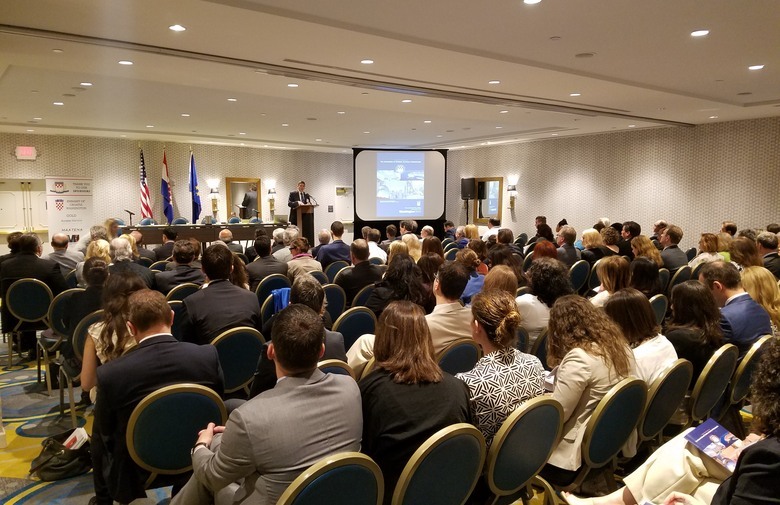 The First In-Person Conference of the Association of Croatian American Professionals (ACAP) held in Washington, DC on April 21st and 22nd was a resounding success. It was a privilege for me to participate with 210 Croatians who all showed their commitment to network, share knowledge, and foster new friendships over two days. The group was about 90% Croatian Americans, however, the twenty-five plus Croatians from Canada and Zagreb gave the conference more of a true global dimension and really enhanced the dialogue of further international collaboration. ACAP President Marko Zoretic and Croatian Ambassador Josko Paro welcomed the 200 plus attendees to a wonderful reception at the Embassy of the Republic of Croatia on Thursday night with tamburitizan music led by Tom Vesolich and his musical ensemble. It was a night of Croatian wine, Plavac Mali and Posip flowing, with new friendships being formed and the "One Global Croatia" theme playing out real-time in person. ACAP Vice President and the President of the organizing committee Dr. Steve Pavletic said, "This is the historical meeting, totally oriented towards the future and one can feel it in the air." Former Senator Mark Begich, was the featured speaker on Friday and gave the receptive audience a captivating and entertaining mix of politics Alaska-style with insights into his days as a U.S. Senator. It was very interesting and inspiring to hear him speak of his father, the first Croatian American Congressman, Nick Begich, and his political achievements. Begich, the first Croatian American U.S. Senator, shared his sincere appreciation for all the Croatian support and interest in his candidacy and victory. He spoke glowingly of his visits to Croatia while serving in the U.S. Senate and mentioned his participation in the annual Ron Brown Summit in Croatia as another Senate highlight. 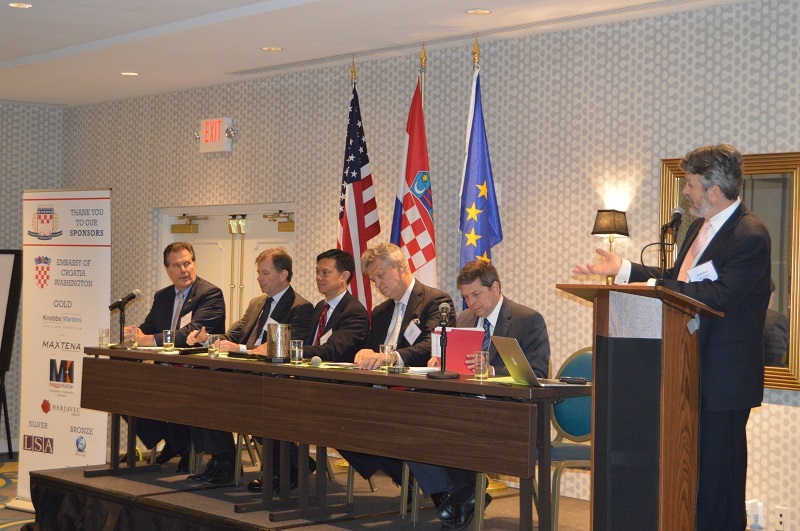 The conference highlighted seven different panels to showcase Croatian Americans’ talent, success and commitment within the fields: National Diaspora Organizations; Future of the U.S. Croatia Relations; Entrepreneurship and BioTechnology; Medicine - Focus on Cancer and Health Tourism; Croatian Space Program; Croatian Arts and Entertainment in the USA; Legal Topics-Immigration and Real Estate. At the first panel a few Ambassadors and ethnic leaders from Macedonia, Slovakia, Italy and Ireland shared their programs to interact, inspire and involve their diaspora with their respective homelands. Meto Koloski, United Macedonian Diaspora President, shared a lot of coherent ideas about how they built their organization and especially to involve more members under the age of forty. Slovakia Ambassador Peter Kmec stood out as an avid advocate of strong collaborative initiatives with Croatian professionals. It was a high honor for me to be part of the U.S. Croatian Relations panel moderated by Ambassador Josko Paro. This politically focused panel included former US Ambassador to Croatia James Foley, the U.S. State Department's Hoyt Yee, Deputy Assistant Secretary of State for Europe and Eurasian Affairs, former Croatian diplomat and Foreign Minister Miomir Zuzul, and Senator Mark Begich. The political panel had a very substantive discussion about the double taxation challenge between the USA and Croatia as one of the major barriers to stronger influx of investments and businesses to Croatia and vice versa. The significance of the floating Liquid Natural Gas (LNG) terminal proposed for the Krk area was a major topic. It was very encouraging to hear that Croatian Canadians in Toronto are involved in the potential financing for this LNG project. Lastly, it was brought up that the Bosnian Croat community still needs our support and involvement and a few National Federation of Croatian American (NFCA) projects were mentioned in that regard. Musician Nenad Bach, founder of the Croatian World Network (CROWN), energized the attendees with his message that we need to further develop the means and media that serve our community to enhance our message and communication. Nenad challenged the audience to globally create more economic leverage by our community committing to buy Croatian products. His theme that art and especially music is a cohesive force in a progressive society is spot on, like his beautiful song from the 1990s, "Can We Go Higher." Nenad has been leading the effort to make direct flights to Croatia from the USA happen. There were so many other speakers and panelists and there's just not enough space to do justice to mention all of them here. ACAP folks were very impressed with the special guest from Zagreb, Davorin Stetner, and all his progressive work with the Kreator Group, and his media and digital achievements and also with the Croatian Business Angels Network. Similarly, Professor Slobodan Bosanac of Swiss Space System Zagreb and Zoran Kahric, Chief Engineer at NASA convinced us that the Croatian space program has a bright future. Dr. Steven Pavletic and his experience at the National Cancer Institute in Bethesda could help his colleagues in Croatia battle cancer, which would also foster research in this utmost important area of biomedicine. Those types of professional collaborations must be further developed. Successful scientists turned entrepreneurs such as Dr. Boro Dropulic of Lentigen in Maryland and Dr. Dubravko Kicic of the Biocenter in Zagreb discussed specific ideas to take this field of medicine forward in Croatia and make it a focal point of economical progress. The Friday sessions closed at The Embassy Row Hotel with excitement as President Kolinda Grabar Kitarovic visited, after a busy day in the U.N., to extend her well wishes. The Croatian President delivered an excellent and inspiring ten-minute speech. She thanked everyone for their efforts and challenged the Croatian diaspora to be even more involved with their time and talent to further help develop Croatia. The gathered Croatians were so appreciative of the President's visit to this conference and her willingness to meet, greet and allow pictures to be taken with her at the meeting. The Embassy's Friday night's reception featured entertainment by musician Nenad Bach, guitarist Dr. Miroslav Loncar and tambura star, Tom Vesolich. The ACAP celebration continued past 11:00 pm that night to put a little more icing on the ACAP cake. Successful conferences do not happen at random and it was very impressive to see all the volunteers that made this event happen. The DC local Hrvatska Ura group and the Croatian Embassy staff are to be commended for all their wonderful organizing, preparation and dedicated work. It should be mentioned that National Croatian Fraternal Union President Ed Pazo and NFCA President Mijo Radocaj were there both days to show support and to network and were part of many dialogues about more cooperation and collaboration on many fronts. This first ACAP conference has set in motion a new era for more global Croatian collaboration and proposed coordination and it's up to our community to build on this opportunity. Please visit their web site at www.CroAmPro.com for more information. U petak je u Washingtonu održana javna konferencija novoosnovane neprofitne Udruge hrvatsko-američkih stručnjaka. Riječ je o prvom takvom skupu u Sjevernoj Americi na kojem se okupilo dvjestotinjak domaćih i stranih sudionika. Kako otkriti brojne poslovne mogućnosti za suradnju, ne samo između Sjedinjenih Američkih Država i Hrvatske, nego i stručnjaka hrvatskog podrijetla sa sunarodnjacima u domovini, bio je glavni cilj konferencije. Skup su otvorili Marko Zoretic, predsjednik udruge i Joško Paro, veleposlanik Republike Hrvatske u Washingtonu. Svoja iskustva o poslovnom povezivanju domovine s iseljeništvom iznijeli su predstavnici stranih diplomacija Poljske, Slovačke, Bugarske, Italije, Irske i Švicarske. Raspravu o hrvatsko-američkoj suradnji u političkim okvirima vodili su: Joško Paro, hrvatski veleposlanik, Steve Rukavina, potpredsjednik Hrvatsko-američke nacionalne kulturne organizacije te Miomir Žužul, bivši ministar vanjskih poslova Republike Hrvatske. Iz američkih političkih krugova prisutni su bili: James Foley, bivši američki veleposlanik u Hrvatskoj, Hoyt Yee, pomoćnik ministra vanjskih poslova SAD-a u Odjelu za Europu i Euroaziju te Mark Begich, bivši senator Aljaske i sin hrvatskih doseljenika. Zaključnu riječ imala je predsjednica Republike Hrvatske Kolinda Grabar-Kitarović. Izrazivši zadovoljstvo zbog želje za jačanjem prekooceanskih veza, Grabar-Kitarović rekla je kako nove ideje i partnerstva mogu doprinijeti domovini koja se suočava s visokom stopom nezaposlenosti, smanjenjem broja stanovnika, negativnim prirodnim prirastom i nacijom koja stari. "Uvjerena sam kako možete pomoći Hrvatskoj pri rješavanju ovih probleme", istaknula je predsjednica i pozvala organizatore da se "vrate" u domovinu sa svojim poslovima. "Surađujte s hrvatskim tvrtkama i iskustvom pomozite našim proizvodima da postanu konkurentni". Skupu su prisustvovali hrvatski generalni konzuli u Sjedinjenim Američkim Državama: Spomenka Cek, Sanja Laković i Siniša Grgić te Ina Rodin, direktorica Hrvatske turističke zajednice za Sjevernu Ameriku. Konferencija je organizirana uz potporu Veleposlanstva Republike Hrvatske u Washingtonu.